Mexico is the second most dangerous country in the Americas to be a priest, according to the Catholic Church’s Information Service of the Pontifical Mission Societies, known as the Agenzia Fides. In the past eight years 22 Catholic priests have been killed in Mexico. This figure is only surpassed by Colombia, where during the same period 25 clergy came to a violent end. During this time frame the worst year was 2011, in which five Mexican priests were killed. This was followed by the period between 2004 – 2005, when another five were murdered due to their work “in areas of extreme poverty, violence, and at the crossroads of criminal activity.” A common feature was a willingness to speak out in matters of social justice. 2006 was something of a respite – in that year not a single priest was killed in Mexico. That year, however, also marked the beginning of president Felipe Calderón’s “war on drugs”, which has unleashed a wave of violence that has left over 60,000 dead. In fact, the presidency of Felipe Calderón has been the most dangerous for Catholic priests since the Cristero War raged in the late 1920s. At that time, the fiercely atheistic president Plutarco Elías Calles began an extensive persecution of the Church, resulting in a violent revolt that left thousands dead, many of them priests. All in all, during Felipe Calderón’s six year tenure in office (2006-2012) 17 priests were killed in Mexico. And in the early days of the Peña Nieto administration, things don’t seem to be improving. 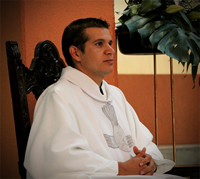 The young priest Santiago Alvarez, of the Diocese in Zamora, Michoacán, went missing on December 27, 2012, and has not been found. Santiago Alvarez was last known to be driving near the city of Jiquilpan, Michoacán, directly south of Lake Chapala and east of a popular tourist destination, the “Pueblo Mágico” Mazamitla. This is near the border with Jalisco, where warring drugs gangs have been very active of late.